The only thing that stresses out homeowners more than protecting their home and their loved ones is protecting their valuables. The valuables in your home can be stolen, damaged or destroyed through burglary, arson, natural disaster and a myriad of other factors. Money, jewelry, important items, and other valuables need to be protected in your home. Take burglary. According to data compiled by the FBI, roughly 542 burglaries happen to every 100,000 people. Over 2.5 million burglaries occur in the United States every year. Over 66% of all burglaries are home break-ins. Burglaries are 300% more likely to happen in homes without a security system or alarm. However, burglaries are not the only threat to your home valuables. There are about 360,000 home, building, and structure fires in the United States every year. Almost $7 billion worth of damage occurs to building structures annually. It is not only structure damage, but homeowners also lose important documents, valuables, and priceless sentimental items as well. 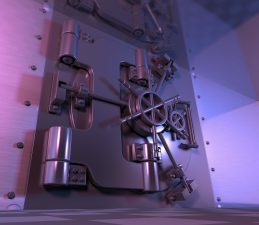 One of the most practical insurance protections that you can invest in for the sake of your valuables is renting a private safe deposit box. Whether it be cash, jewelry, deeds, birth certificates, sentimental items like pictures, and more, you can keep them safe there. It is not as expensive as you might think. Also, the expense relative to the loss of home valuables, through burglary or fire, will be worth it. The federal government regulates banks, and can’t store everything. Also, while you can invest in a home safe, the best models are expensive, heavy, and will attract undue attention upon installation. The average burglar may be someone you know in passing or a neighbor who lives nearby. Further, thieves can steal small home safes from your home and open them later. Also, in a more worst-case scenario, a home invader could force you to open a secure home safe. A private safe deposit box can be located on the premises of a private business, and is protected with security, electronic security, and insurance coverage to cover the storage of your valuables. Ultimately, you can use a private safe deposit box as a shield against home burglary. Safe deposit boxes in almost all banks require some form of ID for access. Most private safe deposit companies afford you the convenience of renting anonymously. You just need your key. Some companies may require biometric data, like an iris scan, to allow you access to your safety deposit box. All you have to do is pay for rental fees to own a private safe deposit box. This can cost you hundreds or even thousands of dollars every year. That may sound like a lot, but this is the security of your valuables that we are talking about. The average cost of a storage unit, which is primarily used to store junk, is about $100 a month. Or, over $1,000 a year.